Unfortunately due to staffing issues we will no longer be open to the public on Saturday’s effective 2/10/18. Our last day open on Saturday’s will be 2/3/18, we will continue to be open on Tuesday’s and Thursday’s 12p – 3p. 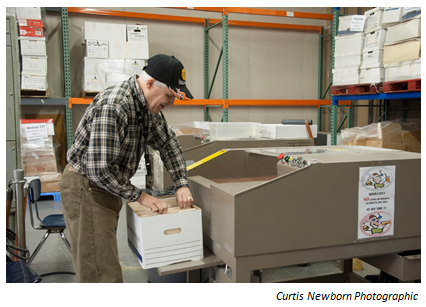 Clearbrook launched a document destruction business enterprise in 2008, providing a valuable service to the community, while creating job opportunities for adults with developmental disabilities. 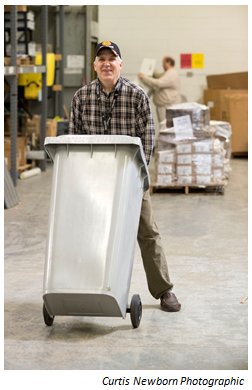 We welcome drop-offs at our Palatine facility as well as a monthly container rental that we can pick-up and change-out. Our clients are involved in the pick-up, preparation, sorting and destruction of the documents. Click here for a 10% off coupon on your first order! New job opportunities have been created for eight of our clients that work in Document Destruction. New business partnerships have been built with companies in the community including doctor’s and attorney’s offices. What are your hours and location? Drop off hours are Tuesday and Thursday from 12:00 – 3:00 p.m. at the north side of our Getz Building, 746 S. Vermont Street, Palatine, IL 60067. Please note we will be closed on Thanksgiving, Christmas and New Year’s. We also welcome drop offs by appointment. What are your prices? Prices are $5.00 per standard size paper box; $7.00 per legal size paper box; or $0.15 per pound. We also provide monthly container rental and change out. A 32 gallon container is $25.00 per container; a 32 gallon console is $30 per container; a 65 gallon container is $30.00 per container and includes rental of container, monthly scheduled pick up of filled container and replacement with an empty container. Do you provide pick up services? Our pick up fee pick up and deliver charge for monthly containers is $0.52 per mile. One time pickups can be scheduled as needed. Mileage ($0.52) and per box/per pound prices (as noted above) will apply. Where is the paper actually shredding and stored? The paper is shredded on site by our trained document destruction crew. For smaller quantities, you may watch your documents as they are shredded at time of drop off. For larger quantities, your documents are stored in our secured and locked area until they are ready to be shredded. A certificate of destruction is given to all customers. What type of payment do you accept? Cash, credit cards and checks (payable to Clearbrook). Supported Employment Job Coaches – Supervise and assist the clients that perform the preparation, sorting and destruction of the documents. Job coaches are trained to maintain a secure and confidential document destruction environment. Document Destruction Crew – Comprised of clients that participate in our Community Employment Services Program. These clients perform paid work which includes preparation, sorting and shredding and are responsible for maintaining a secure and confidential document destruction environment. Community Employment Supervisor – Supervises the crew and maintains a secure and confidential document destruction environment. Coordinates document pick ups/drop offs, customer inquiries, storage and removal of documents as well as staff and client training. If you would like more information about Clearbrook’s Document Destruction services, please contact Michael Dalton, Director of Operations at 847-385-5017 or docdestruct@clearbrook.org.